I had reservations when I first heard about Penguin India’s Metro Reads, a series of books billed as “fun, feisty and fast”. Not because I think literature should be elitist or exclusive (or because it’s dangerous to read in Delhi trains) but because the hurried production of low-cost books almost guarantees shoddiness in editing – and, by extension, writing. Given the nature of the process, even the most gifted young authors are unlikely to learn from mistakes or refine their skills. As it is, there’s too much assembly-line production in most of the big Indian publishing houses these days. It's difficult to find a book that doesn't have a typo every two or three pages - something that was once deemed unforgivable. Editors often have unreasonable monthly targets and when you have a conversation with some of them you could swear you were talking to a marketing person, concerned more with “packaging” and “positioning” – and bragging about how many copies their last book sold – than with providing writers direction and good advice. 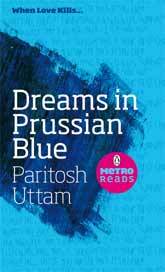 So I was nicely surprised by Paritosh Uttam’s Dreams in Prussian Blue, which is an example of what a good, solid "metro read” can be. It’s character-driven, written in sober, non-frills prose, and the story – about the personal tragedies of two young people in a live-in relationship – keeps you turning the pages at a quick rate. Michael is the brilliant (and moody, and self-centred, and frequently obnoxious) painter who loses his eyesight after an accident, but the book’s real protagonist – and its emotional pivot – is his long-suffering lover Naina, who is forced into the position of caretaker just as she was on the verge of ending their relationship. When Michael determines to somehow resume painting, the cash-strapped Naina becomes dependent on a mutual friend for supplies, and their world turns blue in more ways than one. Dreams in Prussian Blue is a reminder of the pleasures of a strong story, briskly told. Only rarely does Uttam’s writing seem self-conscious (as in when Naina “found the rents nothing short of Revelation”) or strike a false note. For instance, I thought the central relationship slightly strained credibility in places. In one passage Michael and Naina are sitting together on Marine Drive, doing nothing more than having a quiet conversation (for once), Michael is recalling his childhood memories, and Naina asks him “Anything about your father?” This after they’ve already been together for nearly two years. What do these two really talk about, I wondered, and how did they manage to stay together for so long (before Michael lost his sight, that is)? But this is a minor niggle, because Dreams in Prussian Blue is driven by Naina; she’s the object of our sympathy and the story turns on her actions and choices, which are mostly convincing. She’s the pragmatic half of the relationship, keeping her head out of the clouds and her own dreams on hold, making sacrifices for a man whose life revolves around his canvas and his interior world (and who tends to be insensitive to other people's needs because his own material needs are so minimal). I thought it impressive that a male writer could portray her with such empathy. Incidentally Uttam’s book and the two other Metro Reads – Bhavana Chauhan’s Where Girls Dare and Amrit N Shetty’s Love Over Coffee (I haven’t read them yet) – were jointly launched at Penguin’s Spring Fever festival at the India Habitat Centre last week. The IHC amphitheatre was a fabulous outdoor venue for these informal sessions, and I hope more book-event organisers in Delhi pay attention. Places like Lodi Garden and the Garden of Five Senses could do nicely for late-evening sessions, even in the summer months. I was a little disappointed with the Spring Festival in the sense that the discount offered on Penguin titles was too minimal - especially when one can order via flipkart for a much cheaper price. However I do agree that the IHC is a brilliant place for such events and more of these will surely be a good thing. Debasish: I don't know what discount was being offered at Spring Fever, but in any case the Midland's book shop (branches in Aurobindo Market, South Ex and CP) has a round-the-year discount of 20 percent on most titles. Probably makes more sense buying from there. Sorry, off topic: Have you come across the book Delhi Noir? I'm often in a dilemma to buy books such as Metro Reads because I fear that since it's such a short book I might end up craving for more and end up cribbing about why the author didn't write a full-fleged novel. has that ever happened to you? also,Don't know about Jai, but I've read quite a bit of Delhi Noir, Rahul. enjoyable read it is. And what about typos that you feared? Rahul: I've had the book lying around for a while but haven't been able to read it yet. ...I fear that since it's such a short book I might end up craving for more and end up cribbing about why the author didn't write a full-fleged novel. Aayush: that's an unusual perspective. Wouldn't you feel the same way about starting short stories/essays? More to the point, if you really love a book, it always gets over way too soon, even if it's 900 pages long; conversely, if you don't like it, it can't get over soon enough, even if it's a novella. In that sense, there's no such thing as optimum length. I wasn't very impressed with the bit the author read out at the launch. Is the rest of the book similar (in which case I'm unlikely to enjoy it) or does it get better? Aishwarya: I don't remember what passage he read out - I was at the back somewhere, talking with Hemali about our dogs, not paying too much attention to the readings. Thanks for the review, Jai. Aishwarya, I would strongly recommend not going by my public speaking (or reading out) abilities :-) That was my first ever book reading session! I hope you will give the book a try. It is a short novel, so it won't take more than a day if you are a fast reader. Jai, did not know where to write to you, so am posting the comment here. Have you heard of this book called the "Immortals of Mehula" by Amish (http://shivatrilogy.com). This book has a very interesting premise. I read the sample chapter available online and found the treatment too simplistic for a mysterious person like lord shiva. 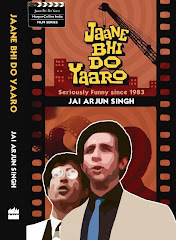 Just wanted to know your views on this book. Nishant: no, haven't read the book - will try to sometime. And my email ID is on the Profile page.